I received the book Viva Margarita as a gift a couple of years ago, and Kurt and I flipped through it again last week to pick a couple of interesting cocktails. We’ve done wine tastings and beer tastings, so why not a cocktail tasting? There are several great drink ideas in the book, all involving tequila, like the Noches Mexicanas with half and half and Frangelico, the Avocado Colada, and the Mango Pellegringo, and choosing two was difficult. Our bottle of tequila had just enough left in it for two options, so we mixed and judged. The first cocktail we selected was the Feisty Jamaican Splash. This is a little like a tequila mojito. Mint leaves were muddled in each chilled glass with some sugar and lemon juice. Tequila was added, then ice, and it was topped with Jamaican ginger ale. I initially thought that I would taste this and wish it had been made with rum. I was wrong. The tequila, surprisingly, worked quite well with the lemon and the mint. The ginger ale sweetened it up and added some fizz, and the drink was well-rounded and delicious. I gave this one four and a half stars out of five, and Kurt gave it four. The second contestant in battle cocktail was Cuatro Amigos Liquados, or a blended cocktail involving raspberries and lime, lemon, and orange juices. Those ingredients were placed in a blender along with honey, half and half, ice, and tequila. I thought for sure this one would be the clear winner. It sounded like a great combination. Unfortunately, it was a little thick in texture and crunchy from the raspberry seeds. This did make an excellent alcoholic smoothie, but Kurt and I both scored it at three stars. Perhaps the Feisty Jamaican won it because it caught us off-guard. 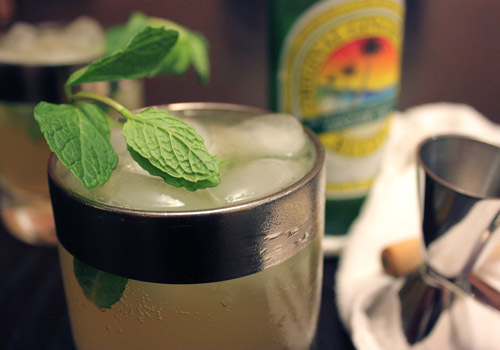 A good ginger ale with a strong ginger flavor played very well with the lemon, mint, and tequila. 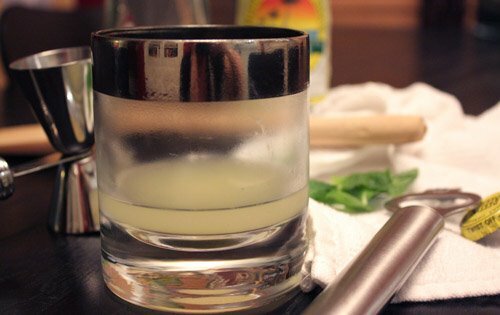 It wasn’t too strong or too sweet or too anything, and it’s a simple enough cocktail to enjoy with hors d’oeuvres. The Cuatro Amigos was nice in its own way, but seemed more filling and somehow less interesting. Timing and atmosphere could affect the success of these drinks. For instance, if I were sitting outside on a July afternoon, this blended one would probably win it hands down. Oh I could use a cocktail right now! I've been thinking about making cocktails from a little cocktail book I have, but have not gotten around to do it. It looks so good! The Feisty Jamaican sounds wonderful to me. I love ginger beer. I would never have thought to put tequila and ginger beer together. This drink looks so refreshing. Your pictures are great! 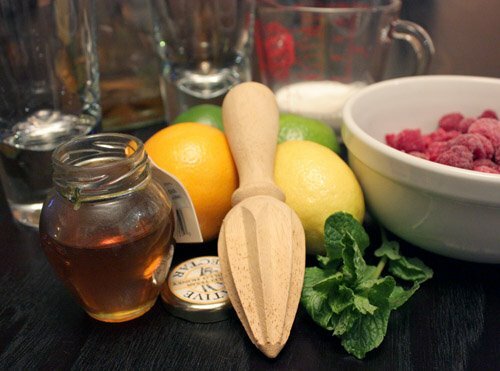 How fun to make and taste these gorgeous cocktails! That's looks really refreshing! I have 2 bottles of Tequila sitting at home, got them as souvenirs when I went to Cancun a few years ago. I have gotta try your recipes, thanks! MMMMM...those cocktails look so delicious! !The pictures look great!! A cocktail tasting is a great idea (I am not a wine person)! Ooo, you've just whetted my thirst for a few delicious tequila cocktails. Your descriptions were so beautiful, I could taste them in my mouth! I will not be giving up tequila or wine on my diet! That sesame cake is my kind of dessert. I love trying and tasting new things. 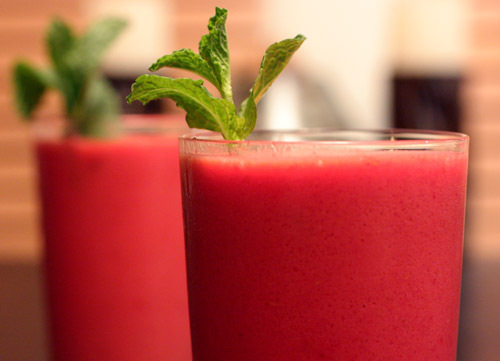 These coctails seem fabulous! I'm especially interested in the first one tequila with lemon and mint. I just imagine it and my mouth gets watery. I wish I could grab it from my PC screen. This sounds awesome.. I love these cocktails. How have I not found you before? how beautiful! i think that we sorely need one of those around here tonight! you've inspired me to do a little extra shopping trip. yum, lisa!